An international research team based at the University of Toronto’s Munk School of Global Affairs has released a detailed report that tracks and analyzes the difficulties of broadcasting the news into jurisdictions that censor the Internet, including Iran and China. The report, titled Casting a Wider Net: Lessons Learned in Delivering BBC Content on the Censored Internet, reports on a series of real-world tests to deliver access to BBC websites into Iran and China, where they are regularly blocked by authorities. The research combines data from three major sources: two years’ worth of traffic data from the BBC’s web content services, in-field testing of Iranian and Chinese Internet censorship undertaken by the OpenNet Initiative (ONI), and service delivery of Psiphon Inc, a Canadian “circumvention” service that delivers uncensored connections to the web for citizens living behind national firewalls. Casting a Wider Net sheds a bright spotlight on what is typically a shadow game: the race among government censors to block content, and those determined to sidestep those efforts. China and Iran are among the world’s most pervasive filters of Internet content, and present a special challenge to global media broadcasters who are often targeted by governments for blocking. BBC’s Mandarin and Farsi services are normally subject to intense blocking efforts by both countries. 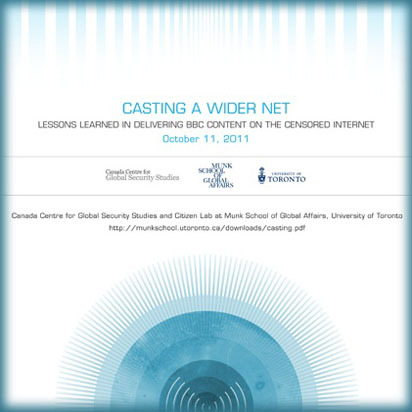 The full report can be downloaded freely online at http://uoft.me/casting. To read the New York Times article on the report, click here.